After a rest in the hotel we went out for some supper and found a most interesting little place. Obviously they specialised in vegetarian foods but only exclusively. There were two traditional Japanese low tables each for 4 people and space for 8 people to sit at the bar with the cooking and preparation on the other side. It was a couple – a man and woman dressed in a kimono – doing everything. She spoke good English and did some of the cooking and the serving while he did most of the cooking. 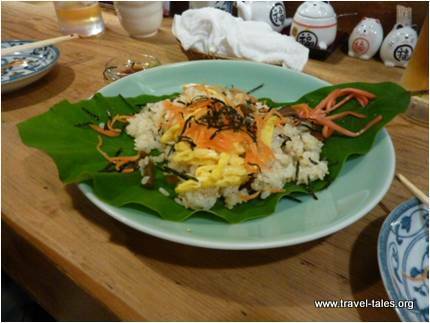 We ordered the ‘June Special Sushi’ – not little carefully wrapped portions but a pile of rice with mushrooms and lotus in it covered then with carrot, ginger and something dark which we never identified all served on a Homa leaf. To follow we then had the ‘King of Local cuisine’. This was a dish not unlike what we had had in Odawara but it was cooked in a little pan which was so hot when put in front of us that it could cook the food. When we left the lady came out to the front to ask about the salwar chemise I was wearing. It was very nice that she showed her curiosity about us, just as we did about her! I noticed that she had the sleeves of her kimono tied back with a figure of eight band across her back and shoulders, I later noticed that such a band was often (but not always) worn sometimes tied in a nice bow at the back even if the sleeves were not hooked back in it, I suppose they could have been tucked in if/when necessary.